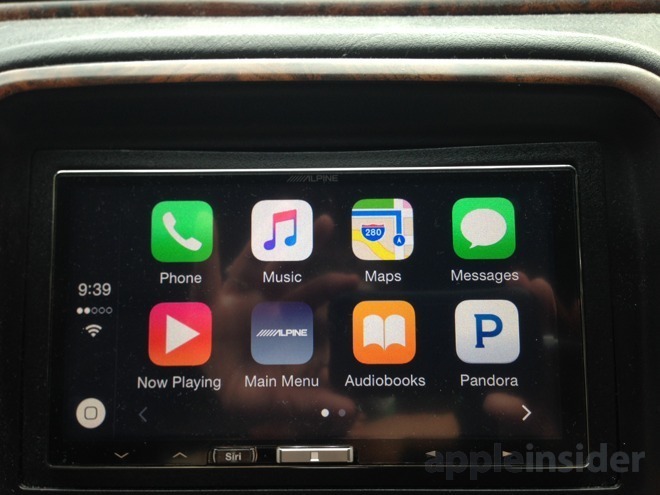 CarPlay functions are unmentioned in Pandora's release notes, or even on Apple's website, but should nevertheless be available when an iPhone connects to a vehicle. After selecting the app from the homescreen, users should see a simplified menu with premade stations, as well as the option to shuffle all of them for variety. A Now Playing window offers menu options to vote a track up or down, despite the potential distraction to drivers. Relatively few iPhone apps have introduced support for CarPlay since the platform launched in 2014. Apart from a few Apple apps, like Maps and Music, some examples include Spotify, Rdio, and Overcast. Part of the problem is that relatively few vehicles even support the standard. Automakers like Honda, Porsche, Chevrolet, and Volkswagen are now on board, but typically only in select 2016 models. Older cars can be upgraded via headunits from Alpine, Kenwood, or Pioneer, but these cost several hundred dollars each plus installation expenses.